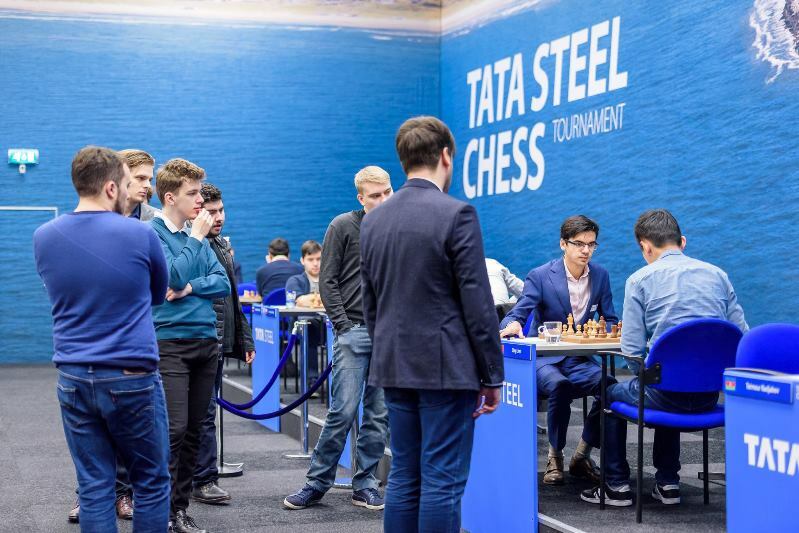 “Today was just insane”, commented Vishy Anand after beating Vladimir Kramnik to join the Tata Steel Chess leading pack. 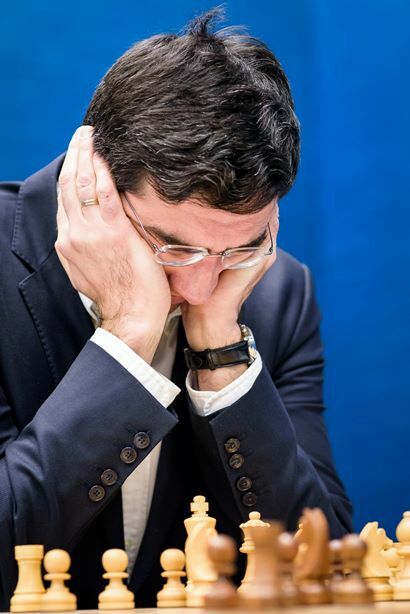 He was referring to Vlad’s erratic opening play, which initially went unpunished, while Peter Svidler used the term “absolute insanity” about the complications in Radjabov-Vidit. 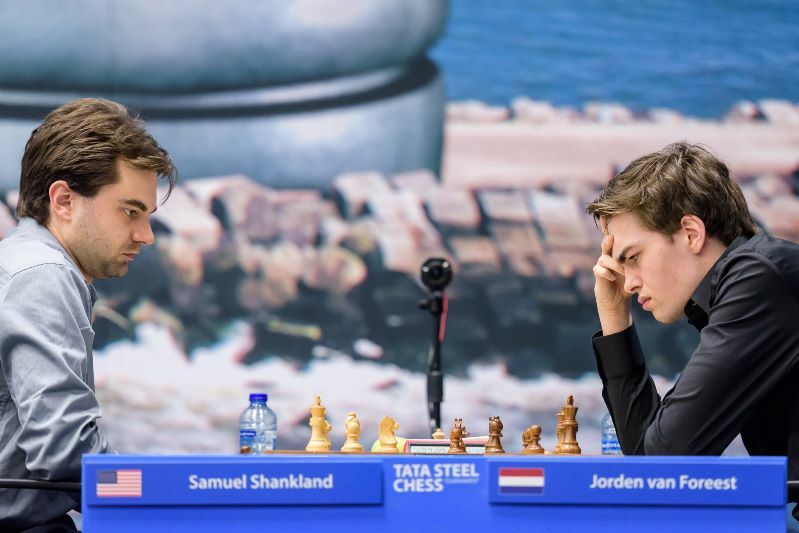 Eventually Teimour scored his first win in this year’s Masters, and there was also a first win for Sam Shankland, who ground down Jorden van Foreest in a knight ending. 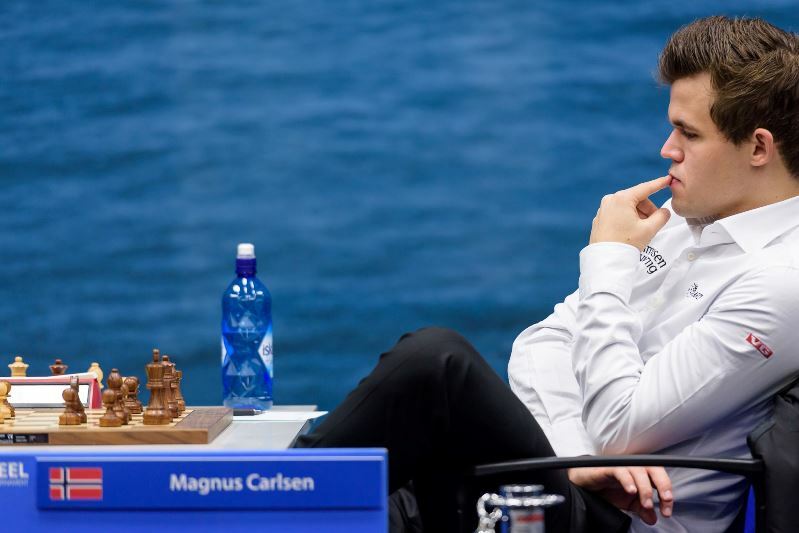 Magnus Carlsen was made to suffer by Vladimir Fedoseev, but the World Champion held on. I know he’s very optimistic these days, but his opening – what he was doing, g4, allowing Nxd5, and then Kf1 – I was embarrassed that I was not better. I was teasing him afterwards that this was a game where some young player is playing rubbish to take advantage of his old opponent! Somehow we staggered through the game. Our impression was we played it quite badly, that there were just too many mistakes. Any quick summary of what followed is impossible, so we’re lucky to have 47 minutes of analysis from 8-time Russian Champion Peter Svidler! It’s not too late to spoil things, since 50.h6! was the only winning move. And again after 50…Ne8 51.g6! Kd7 White would throw away the win with 52.gxh7 Nf6+ and even lose after 52.g7 Nf6+. Instead after 52.Kg5 it was time for Jorden to resign. The remaining four games were drawn, with the clash of the leaders, Giri-Ding, the quietest of the round. 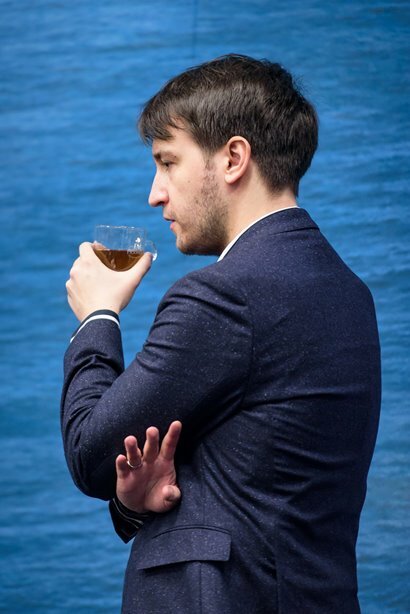 Shakhriyar Mamedyarov no doubt harboured hopes of winning his first game and returning to 50% after the loss against Magnus, but Richard Rapport once again wriggled out of a slightly uncomfortable position. 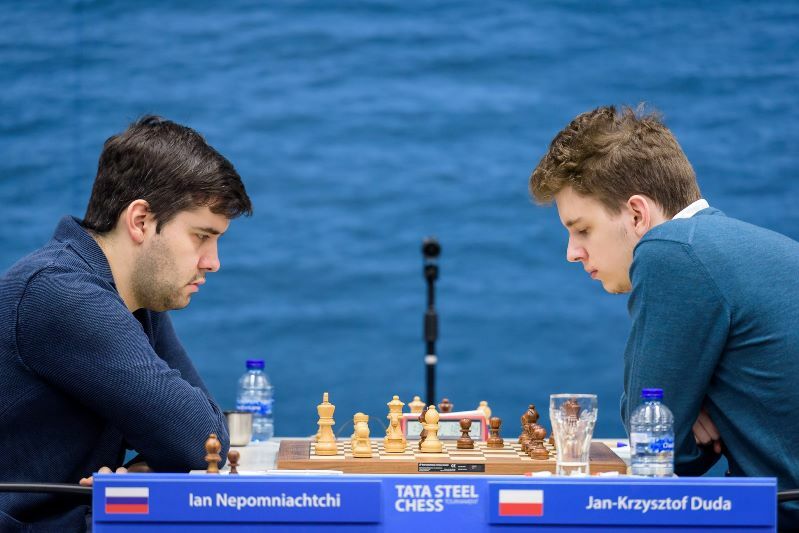 Jan-Krzysztof Duda’s position against Ian Nepomniachtchi was somewhat worse than uncomfortable, though Ian couldn’t break down the fortress. After 7 minutes the World Champion found the strong response 35…Rb2!, however, and after 36.e4 Rf4 37.e5 Re2 38.Re7 Rf5 39.e6 his 39…Kf8 (“very tricky” – Fedoseev) was another finesse. It still required accurate play, but Magnus went on to hold a 74-move draw without too many more adventures. 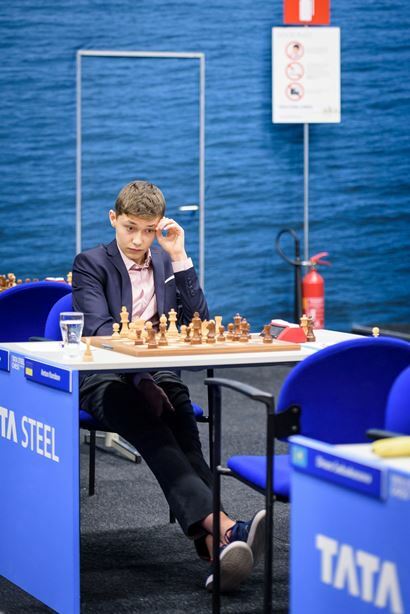 16-year-old Andrey Esipenko won his second smooth white victory of the tournament, this time over top seed Anton Korobov, to leave him only half a point off the leaders. In Round 8 Kuipers faces Chigaev, while Korobov has a chance to catch Kovalev, who he plays him with the white pieces. 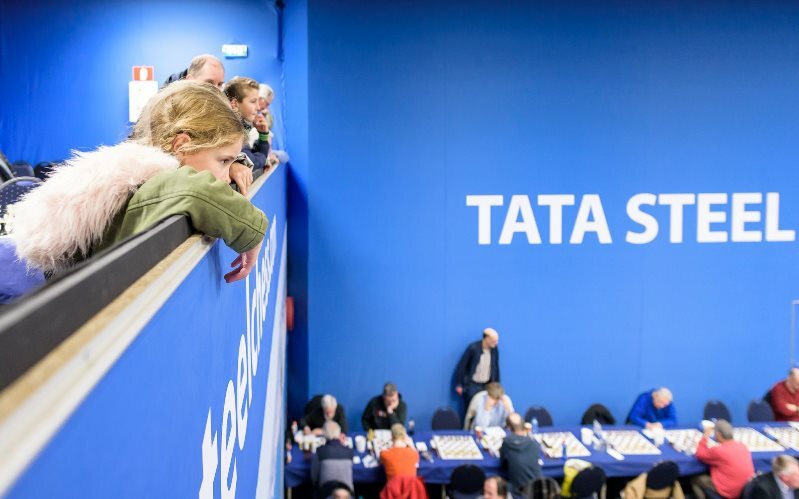 Meanwhile in the Tata Steel Masters Ding Liren-Nepomniachtchi is the only game between leaders, while Carlsen-Rapport is a chance for Magnus to get revenge for losing to Richard in Wijk aan Zee in 2017.